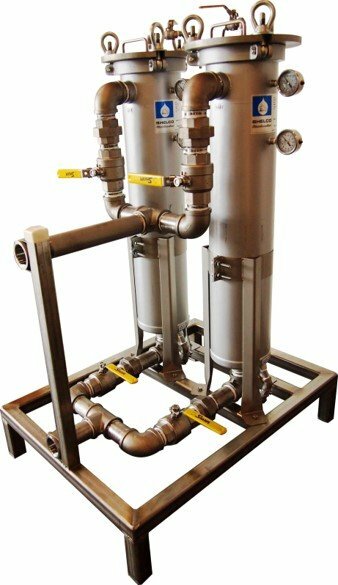 EGM offers skid-mounted, pre-constructed filtration systems that are used for filtering water use in specialty chemical dilution, neat chemical delivery and dilute chemical feed systems. These systems include required valving and pressure gauges for simple operation. Filter bodies are available in strainer, bag, and cartridge filter designs and can be equipped with a wide range of filtration media materials and sizes. Strainers are most commonly configured in either stainless steel, PVC, or CPVC and can be equipped with several different mesh or perforation choices to protect downstream equipment and processes from contamination. Similarly, bag type filter bodies are offered in two different sizes with a broad selection of filtration media available to help fit each specific application.